Once upon a time there was a man who lived in the little back room. He had given up his estate to the heir; but in addition he had three sons, who were named Peter, Paul and Esben, who was the youngest. All three hung around at home and would not work, for they had it too easy, and they thought themselves too good for anything like work, and nothing was good enough for them. Finally Peter once heard that the king wanted a shepherd for his hares, and he told his father he would apply for the position, as it would just suit him, seeing that he wished to serve no one lower in rank than the king. His father, it is true, was of the opinion that there might be other work that would suit him better, for whoever was to herd hares would have to be quick and spry, and not a sleepy-head, and when the hares took to their heels in all directions, it was a dance of another kind than when one skipped about a room. But it was of no use. Peter insisted, and would have his own way, took his knapsack, and shambled down hill. After he had gone a while, he saw an old woman who had got her nose wedged in a tree-stump while chopping wood, and when Peter saw her jerking and pulling away, trying to get out, he burst into loud laughter. “Don’t stand there and laugh in such a stupid way,” said the woman, “but come and help a poor, feeble old woman. I wanted to split up some fire-wood, and caught my nose here, and here I have been standing for more than a hundred years, pulling and jerking, without a bit of bread to chew in all that time,” said she. Then Peter had to laugh all the harder. He found it all very amusing, and said that if she had already been standing there a hundred years, then she could probably hold out for another hundred years or more. When he came to court they at once took him on as a herdsman. The place was not bad, there was good food, and good wages, and the chance of winning the princess besides; yet if no more than a single one of the king’s hares were to be lost, they would cut three red strips from his back, and throw him into the snake-pit. As long as Peter was on the common or in the enclosure, he kept his hares together nicely, but later, when they reached the forest, they ran away from him across the hills. Peter ran after them with tremendous leaps, as long as he thought he could catch even a single hare, but when the very last one had vanished, his breath was gone, and he saw no more of them. Toward noon he went home, taking his time about it, and when he reached the enclosure, he looked around for them on all sides, but no hares came. And then, when he came to the castle, there stood the king with the knife in his hand. He cut three red strips from his back, and cast him into the snake-pit. After a while Paul decided to go to the castle and herd the king’s hares. His father told him what he had told Peter, and more besides; but he insisted on going, and would not listen, and he fared neither better nor worse than Peter had. The old woman stood and pulled and jerked at her nose in the tree-trunk, and he laughed, found it very amusing, and let her stand there and torment herself. He was at once taken into service, but the hares all ran away across the hills, though he pursued them, and worked away like a shepherd dog in the sun, and when he came back to the castle in the evening minus his hares, there stood the king with the knife in his hand, cut three broad strips from his back, rubbed in pepper and salt, and flung him into the snake-pit. Then, after some time had passed, the youngest decided to set out to herd the king’s hares, and told his father of his intention. He thought that would be just the work for him, to loaf about in forest and field, look for strawberry patches, herd a flock of hares, and lie down and sleep in the sun between times. His father thought that there was other work that would suit him better, and that even if he fared no worse than his brothers, it was quite certain that he would fare no better. Whoever herded the king’s hares must not drag along as though he had lead in his soles, or like a fly on a limerod; and that when the hares took to their heels, it was a horse of another color from catching flees with gloved hands; whoever wanted to escape with a whole back, would have to be more than quick and nimble, and swifter than a bird. But there was nothing he could do. Esben merely kept on saying that he wanted to go to court and serve the king, for he would not take service with any lesser master, said he; and he would see to the hares, they could not be much worse than a herd of goats or of calves. And with that he took his knapsack and strolled comfortably down the hill. After he had wandered a while, and began to feel a proper hunger, he came to the old woman who was wedged by the nose in the tree-trunk and who was pulling and jerking away, in order to get loose. “Good day, mother,” said Esben, “and why are you worrying yourself so with your nose, you poor thing?” “No one has called me mother for the last hundred years,” said the old woman, “but come and help me out, and give me a bite to eat; for I have not had a bit to eat in all that time. And I will do something for your sake as well,” said she. Yes, no doubt she would need something to eat and drink badly, said Esben. Then he hewed the tree-trunk apart, so that she got her nose out of the cleft, sat down to eat, and shared with her. The old woman had a good appetite, and she received a good half of his provisions. When they were through she gave Esben a whistle which had the power that if he blew into one end, whatever he wished scattered was scattered to all the winds, and when he blew into the other, all came together again. And if the whistle passed from his possession, it would return as soon as he wished it back. “That is a wonderful whistle!” thought Esben. When he came to the castle, they at once took him on as a shepherd; the place was not bad, he was to have food and wages, and should he manage to herd the king’s hares without losing one of them, he might possibly win the princess; but if he lost so much as a single hare, and no matter how small it might be, then they would cut three red strips from his back, and the king was so sure of his case that he went right off to whet his knife. It would be a simple matter to herd the hares, thought Esben; for when they went off they were as obedient as a herd of sheep, and so long as they were on the common, and in the enclosure, they even marched in rank and file. But when they reached the forest, and noon-time came, and the sun burned down on hill and dale, they all took to their heels and ran away across the hills. “Hallo, there! So you want to run away!” called Esben, and blew into one end of his whistle, and then they scattered the more quickly to all the ends of the earth. But when he had reached an old charcoal-pit, he blew into the other end of his whistle, and before he knew it the hares were back again, and standing in rank and file so he could review them, just like a regiment of soldiers on the drill-ground. “That is a splendid whistle!” thought Esben; lay down on a sunny hillock, and fell asleep. The hares were left to their own devices, and played until evening; then he once more whistled them together, and took them along to the castle like a herd of sheep. The king and queen and the princess, too, stood in the hall-way, and wondered what sort of a fellow this was, who could herd hares without losing a single one. The king reckoned and added them up, and counted with his fingers, and then added them up again; but not even the teeny-weeniest hare was missing. “He is quite a chap, he is,” said the princess. The following day he again went to the forest, and herded his hares; but while he lay in all comfort beside a strawberry patch, they sent out the chamber-maid from the castle to him, and she was to find out how he managed to herd the king’s hares. He showed her his whistle, and blew into one end, and all the hares darted away across the hills in all directions, and then he blew into the other, and they came trotting up from all sides, and once more stood in rank and file. “That is a wonderful whistle,” said the chamber-maid. She would gladly give him a hundred dollars, if he cared to sell it. Yes, indeed, that would suit her right down to the ground; she would gladly give him two kisses with every dollar, and feel grateful, besides. 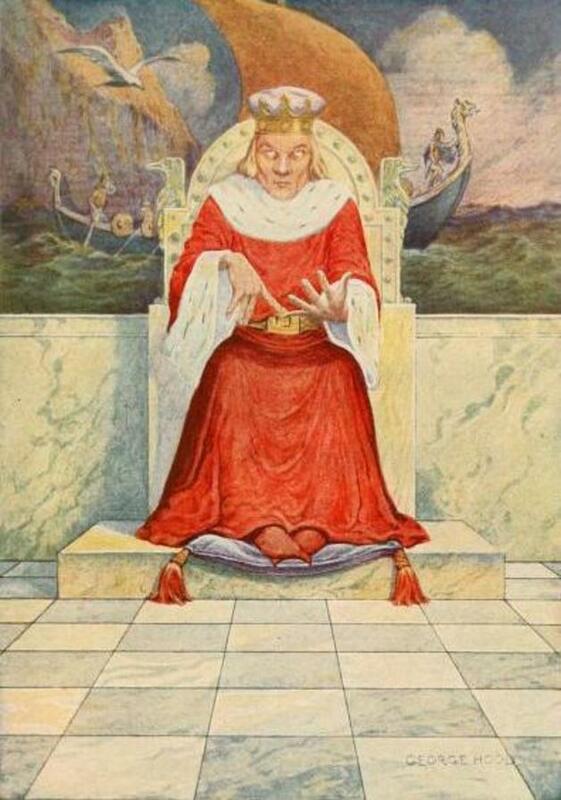 “The king reckoned, counted and added.” Illustration by George Hood, published in The Norwegian Fairy Book by Clara Strobe, (1922), Frederick A. Stokes Company. So she got the whistle, but when she reached the castle, the whistle disappeared all of a sudden. Esben had wished it back again, and toward evening he came along, driving his hares like a herd of sheep. The king reckoned and counted and added, but all to no purpose, for not the least little hare was missing. When Esben was herding his hares the third day, they sent the princess to him to get away his pipe from him. She was tickled to death, and finally offered him two hundred dollars if he would let her have the whistle, and would also tell her what she had to do in order to fetch it safely home with her. “Yes, it is a very valuable whistle,” said Esben, “and I will not sell it,” but at last, as a favor to her, he said he would let her have it if she gave him two hundred dollars, and a kiss for every dollar to boot. But if she wanted to keep it, why, she must take good care of it, for that was her affair. “That is a very high price for a hare-whistle,” said the princess, and she really shrank from kissing him, “but since we are here in the middle of the forest, where no one can see or hear us, I’ll let it pass, for I positively must have the whistle,” said she. And when Esben had pocketed the price agreed upon, she received the whistle, and held it tightly clutched in her hand all the way home; yet when she reached the castle, and wanted to show it, it disappeared out of her hands. On the following day the queen herself set out, and she felt quite sure that she would succeed in coaxing the whistle away from him. She was stingier, and only offered fifty dollars; but she had to raise her bid until she reached three hundred. Esben said it was a magnificent whistle, and that the price was a beggarly one; but seeing that she was the queen, he would let it pass. She was to pay him three hundred dollars, and for every dollar she was to give him a buss to boot, then she should have the whistle. And he was paid in full as agreed, since as regards the busses the queen was not so stingy. When she had the whistle in her hands, she tied it fast, and hid it well, but she fared not a whit better than either of the others; when she wanted to show the whistle it was gone, and in the evening Esben came home, driving his hares as though they were a well-trained flock of sheep. “You are stupid women!” said the king. “I suppose I will have to go to him myself if we really are to obtain this trumpery whistle. There seems to be nothing else left to do!” And the following day, when Esben was once more herding his hares, the king followed him, and found him at the same place where the women had bargained with him. They soon became good friends, and Esben showed him the whistle, and blew into one end and the other, and the king thought the whistle very pretty, and finally insisted on buying it, even though it cost him a thousand dollars. “Yes, it is a magnificent whistle,” said Esben, “and I would not sell it for money. But do you see that white mare over yonder?” said he, and pointed into the forest. “Yes, she belongs to me, that is my Snow Witch!” cried the king, for he knew her very well. “Well, if you will give me a thousand dollars, and kiss the white mare that is grazing on the moor by the big pine, to boot, then you can have my whistle!” said Esben. “Is that the only price at which you will sell?” asked the king. “But at least may I not put a silken handkerchief between?” asked the king. This was conceded him, and thus he obtained the whistle. He put it in the purse in his pocket, and carefully buttoned up the pocket. Yet when he reached the castle, and wanted to take it out, he was in the same case as the women, for he no longer had the whistle. And in the evening Esben came home with his herd of hares, and not the least little hare was missing. The king was angry, and furious because he had made a fool of them all, and had swindled the king’s self out of the whistle into the bargain, and now he wanted to do away with Esben. The queen was of the same opinion, and said it was best to behead such a knave when he was caught in the act. Esben thought this neither fair nor just; for he had only done what he had been asked to do, and had defended himself as best he knew how. But the king said that this made no difference to him; yet if Esben could manage to fill the big brewing-cauldron till it ran over, he would spare his life. The job would be neither long nor hard, said Esben, he thought he could warrant that, and he began to tell about the old woman with her nose in the tree-trunk, and in between he said, “I must make up plenty of stories, to fill the cauldron,”—and then he told of the whistle, and the chamber-maid who came to him and wanted to buy the whistle for a hundred dollars, and about all the kisses that she had had to give him to boot, up on the hillock by the forest; and then he told about the princess, how she had come and kissed him so sweetly for the whistle’s sake, because no one could see or hear it in the forest—“I must make up plenty of stories, in order to fill the cauldron,” said Esben. Then he told of the queen, and of how stingy she had been with her money, and how liberal with her busses—“for I must make up plenty of stories in order to fill the cauldron,” said Esben. “But I think it must be full now!” said the queen. “O, not a sign of it!” said the king. Then Esben began to tell how the king had come to him, and about the white mare who was grazing on the moor, “and since he insisted on having the whistle he had to—he had to—well, with all due respect, I have to make up plenty of stories in order to fill the cauldron,” said Esben. The king and the queen were of the opinion that it would be best for Esben to receive the princess and half the kingdom; there did not seem anything else to do. “Yes, it was a magnificent whistle!” said Esben.